left shoulder, right holding Victoriola and left cornucopiae. Star in left field, S in right field. ANT in Exergue. Minted at officina officina 6 (S) in Antioch (Antakya, Turkey) in 311-312 A.D.
Sutherland, C.H.V., "Roman Imperial Coinage", Volume 6 (RIC), Antioch, p642, nr 162b. hinterlassenen Sammlung und Aufzeichnung des Herrn Paul Gerin" (Voetter-Gerin), Antiochia, Maximinus Daia, p43, #42. Sear, D.R., "Roman Coins and their Values" (RCV Millennium Edition), Vol. 4, p334, nr. 14839. 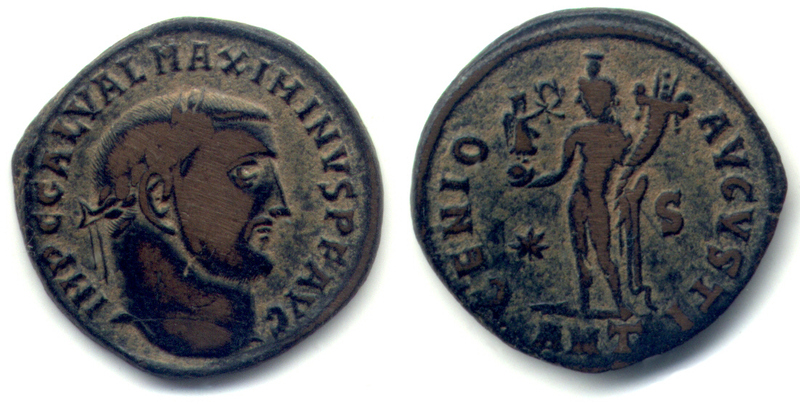 Suarez, R., "ERIC II - The Encyclopedia of Roman Imperial Coins" (ERIC II), p920, nr.478, (B10, O11, R14, T11, M2). note: ERIC II erroneously list T12 for this coin. Van Meter, D., "Handbook of Roman Imperial Coins", p283, nr 10. Cohen, H, "Descriptions Historique des Monnaies frappees sous l'Empire Romain" (C), Volume 7, p145, nr. 32.